It's Fall - my favorite season of the year! I'm pretty excited to be able to have food in my Speech room, and so why not do an apple taste test!? The 5 senses are a great topic, you can get a ton of language out of it and you know it's something they'll use in the classroom. I decided that since apples are one of the healthier options to start with, I'd do some taste tests and focus in on how they tasted, smelled, sounded like, looked like...all the good ones! that you can print out and stick in those speech books for a great story when they get home! 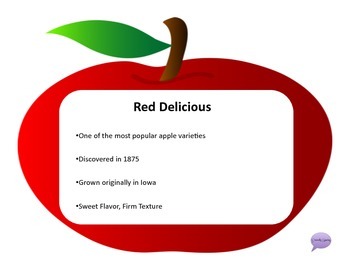 Be sure to try this one with your students, and get to slicing those apples!